As we enter into the final month of 2013, I find myself with a towering review pile, one that's dogeared and bookmarked with titles that have been lingering on that strange and dusty shelf between 'read' and 'did not finish'. Some are books that keep getting nudged aside by tour-date commitments, while others are titles I'm reluctant to cast aside altogether, but which haven't quite managed to 'hook' me and demand that I keep reading. I was originally attracted to Seven Forges by the novelty or the uniqueness of its setting. It seems like the fantasy genre has taken a swing from forests to deserts over the past few years, but rarely does it do frozen wastes. Cover art to to the contrary, however, this really isn't an icebound tale. Despite that, I'm going to stick with the theme and declare that I never quite warmed up to this one. Being that it's an Angry Robot title, and they've rarely disappointed, I kept going back to it, hoping to find that 'hook' to keep me reading, but we never quite connected. Don't get me wrong, this is by no means a bad book. It's imaginative, well-detailed, and full of action. Suitably epic in terms of both world-building and mythology, it has a lot to offer fans of the genre. I found myself admiring James A. Moore a great deal, and desperately wanting to like it. The opening chapters were extraordinarily slow, requiring a great deal of dedication to get through, but I found it did get better, before ultimately exploding in a wild and frantic race to the finish. In terms of narrative, however, I found the telling a bit impersonal. I never really settled into an easy flow with it, and found myself fighting through some passages. Similarly, I didn't really find a character to latch onto as a comfortable point-of-view. The men were strong, the women gorgeous, and the monsters . . . well, monstrous. Some of the characters were interesting, particularly Merros, whom I liked a lot more than Andover, and Desh, who has some great confrontations with the likes of the Emperor, but there was nobody with whom I found myself so deeply invested in their fate that I was anxious to get back to reading. With all of that being said, the final few chapters were absolutely fantastic, with several twists and revelations that had me nodding my head and wondering where that narrative flair was early on. Like Jeff Salyard's Scourge of the Betrayer, it's not a book that is likely to make my top list for the year, but one with enough promise to make me genuinely excited about what's coming next. 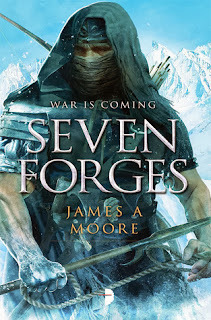 Despite its flaws, Seven Forges definitely showed promise, and had enough glimpses of breakthrough potential to make me wish there was a second book readily at hand to see whether that potential is developed.